With the GQ Ink and software bundle, artists and printmakers can produce museum-quality prints with a desktop inkjet printer. MediaStreet Inc., a leading independent manufacturer of archival-quality inks with matched inkjet media and other innovative, digital solutions for the photographic, arts and consumer electronics industries, is introducing new versions of their award-winning line of Generations Inks, Photo Papers, and their unique Niagara Continuous Ink Flow System. The new products represent years of research and offer the professional photographer alternative, less expensive methods to produce long lasting digital prints. MediaStreet ink and paper has been rated to last beyond 100 years before noticeable fading, making them a favorite among artists, fine art photographers and collectors. Media Street will demonstrate their extensive line of inkjet inks including the new Generations Quad-N-Color (G8) 100% Pigment Ink set. These inks were specifically developed to compliment the Epson R2400, R4800, 7800 and 9800 offering 3 levels of Black (and choice of "Photo" Black or "Matte" Black) offering rich, saturated and robust colors. This new ink set offers higher density pigments that deliver wider color gamut, superior black and white output all from a 100% pigment formulation for long lasting prints. A new line of photographic papers, which have been matched perfectly with the new inks, is also being introduced. One of the most efficient systems available on the market, the Niagara Continuous Ink Flow System eliminates waste, increases efficiency and turns a desktop inkjet printer into a continuous printing workhorse. Moreover, photographers who use Niagara inks with the Bulk Feed System will realize a 90 percent cost savings in ink costs when using MediaStreet dye-based inks and an 80 percent savings when using pigment ink. Media Street is introducing a new archival black-and-white inkjet system for the Epson 2200 designed by fine art photographer and digital imaging consultant Richard Wolfson. This new printing solution incorporates Media Street’s Generations QuadBlack (GQ) pigment ink set, a selection of photographic and fine art papers, plus a special print driver to produce “exhibition quality” black-and-white photographic prints. The company explains, “With the GQ Ink and software bundle, artists and printmakers can produce museum-quality prints with a desktop inkjet printer.” In addition to the new solution for the 2200 printer, the Generations QuadBlack (GQ) system is available for the Epson R200/R300/R320 and shortly for the 7000, 9000 and 4000. The Generations QuadBlack solution prints a long, smooth gray scale from the lightest highlights to the deepest shadows without banding, posterization, or other artifacts. And the variable-tone GQ ink set lets users make cold, warm, neutral, or split tone (platinum) prints without changing inks, simply by selecting from the included library of pre-calibrated printing curves. The full line of MediaStreet inkjet papers are ideally suited for high-quality photographic and fine art reproductions. From high impact glossy paper, to real artist grade canvas to fine art papers, the full range of professional photographers – commercial, event, outdoor, wedding, portrait, fine art – will find these papers will suited for a variety of applications. The newest member of the MediaStreet paper family is their Quad-N-Color line featuring Glossy, Lustre and Photo Matte surfaces. The new papers are specifically matched to the newly introduced Quad-N-Color (G8) inks. Media Street papers are available in 4" x 6", 8.5"x11", 11"x17", 13"x19" and 17"x22" sheets and 24", 36" and 44” roll sizes. While designed and matched for use with Media Street inks, they may be successfully printed using most pigment or dye-based ink – in any high-resolution inkjet printer. 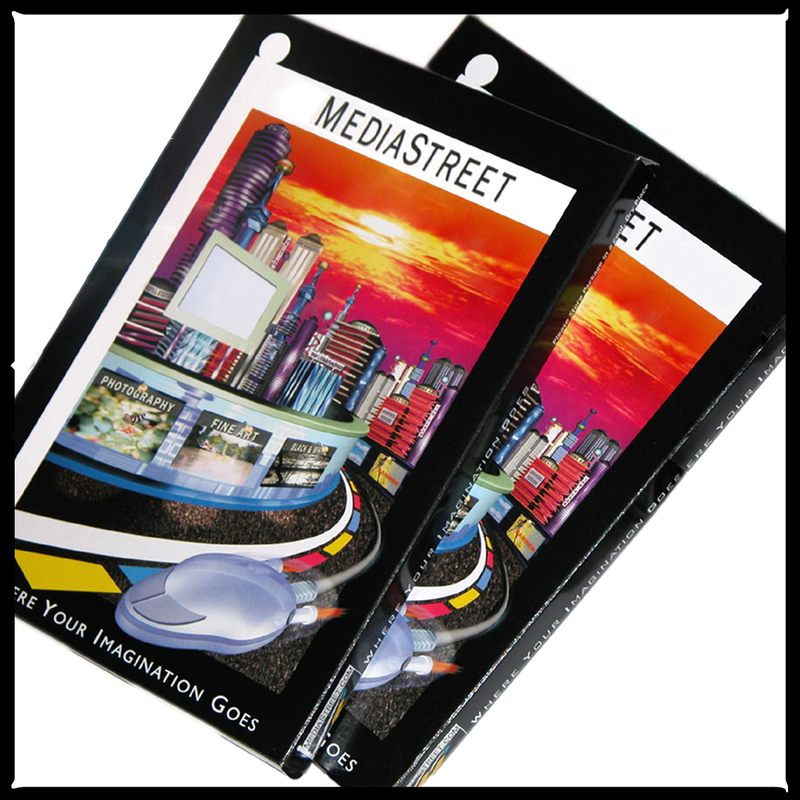 MediaStreet, Inc. is an innovative, independent manufacturer, converter and supplier of nearly everything visual including inkjet papers, ink, multimedia digital display and storage products, for today’s visual and digital world. The company’s tagline, “It’s All about Your Images” is a direct reflection of its commitment to images and imaging, whether printed on one of its archival quality papers using its award-winning, pigmented inks or shared and enjoyed by using any number of MediaStreet’s digital media playback devices for sharing photographs anytime, anywhere. Since its existence in June 2000, MediaStreet has improved the quality of imaging life for more than 10,000 customers in 100 countries worldwide. MediaStreet will continue to pave the road of imaging innovation with a line of products that allow people to share pictures and memories in every conceivable category and in every conceivable place. 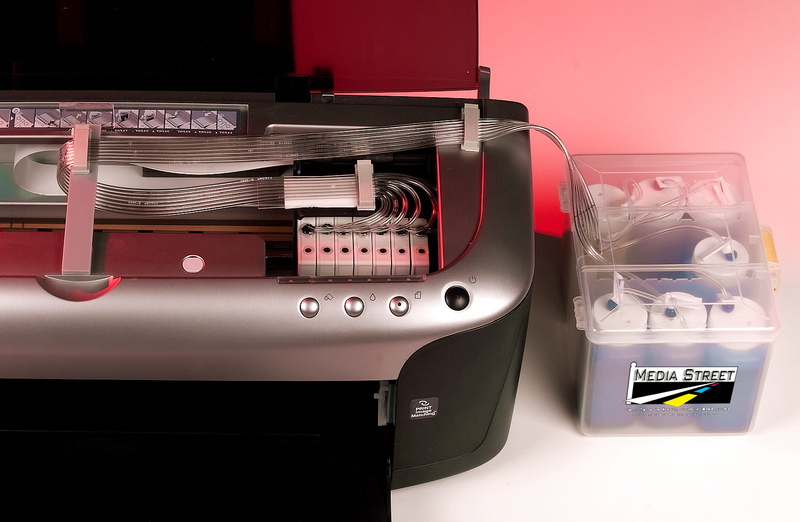 Niagara Continuous Inkflow SystemNever buy a ONE-TIME-USE cartridge again! Save over 90% of our ink costs! Media Street INKJET Paper SelectionChoose from gloss papers, matte papers, fine art papers or real Artist Grade Canvas to Print on! MediaStreet.comInkjet Ink, Papers and Bulk Feed Systems for the Profesisonal as well as the NON Professional who wants high quality and SAVE a lot of money!